The LGBT will one day regret the amount of time they wasted on nonsense. Certainly gays have dealt with their share of discrimination. Almost all “special interest group” feel marginalized to some degree. Do women deal with more than blacks, who’s to say? And what of black women? Perhaps America needs a “hierarchy of discrimination,” so everybody knows the pecking order. America is obviously a great country. Think about how much time we can dedicate to nonsense like the so-called War on Women, police killings of blacks, and so on. Some in the LGBT community are beginning to get it. 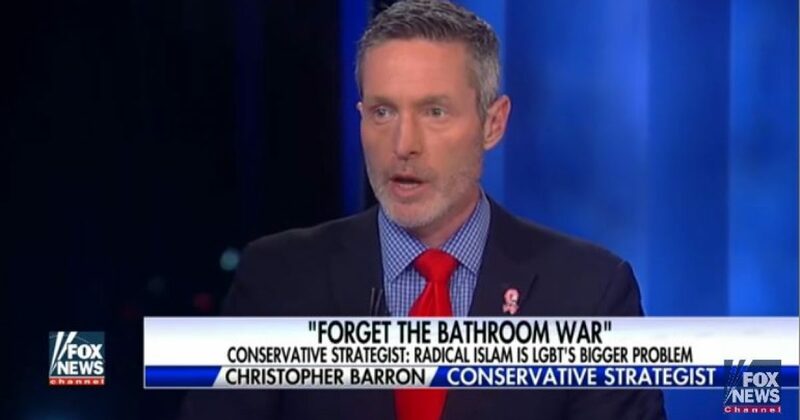 Christopher Barron—a conservative strategist, founder of LGBT group GOProud, and organizer of LGBT for Trump—appeared on Fox News Channel’s “Tucker Carlson Tonight” recently. On the show, he discussed the threat that Islamic extremism poses to LGBT people. Barron highlights for gays what he has seen happening to blacks, Latinos, and women. He penned a controversial article for The Hill, in which he argued a similar point. I agree with Barron. LGBT get out before it’s too late. To support a party or ideology that promotes a dangerous narrative for gays (and other humans) makes no sense.